St Edmund Hall (sometimes known as The Hall or affectionately as Teddy Hall) is a constituent college of the University of Oxford in England. The college has a claim to be "the oldest academical society for the education of undergraduates in any university" and is the last surviving medieval hall at the University. 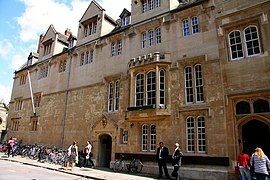 The college is located just off Queen's Lane, near the High Street, in central Oxford. After more than seven centuries as a men-only college, it has been coeducational since 1979. As of 2018, the college had a financial endowment of roughly £58 million. Similar to the University of Oxford itself, the precise date of establishment of St Edmund Hall is not certain; it is usually estimated at 1236, before any other college was formally established, though the founder from which the Hall takes its name, St Edmund of Abingdon, Oxfordshire, the first known Oxford Master of Arts and the first Oxford-educated Archbishop of Canterbury, lived and taught on the college site as early as the 1190s. The name St Edmund Hall (Aula Sancti Edmundi) first appears in a 1317 rental agreement. St Edmund Hall began life as one of Oxford's ancient Aularian houses, the medieval halls that laid the foundation of the University, preceding the creation of the first colleges. As the only surviving medieval hall, its members are known as "Aularians". The college has a history of independent thought, which brought it into frequent conflict with both Church and State. During the late 14th and early 15th centuries it was a bastion of John Wycliffe's supporters, for which college principal William Taylor was ultimately burnt at the stake, and principal Peter Payne fled the country. In the late 17th century, St Edmund Hall incurred the wrath of the Crown for fostering non-jurors, men who remained loyal to the Scottish House of Stuart and who refused to take the oath to the German House of Hanover, whom they regarded as having usurped the British throne. Queen Elizabeth II approved St Edmund Hall's charter of incorporation as a full college of the University of Oxford in 1957, although it deliberately retained its ancient title of "Hall". The Duke of Edinburgh presented the royal charter to the college in June 1958. In 1978, women were first admitted as members of the Hall, with the first matriculations of women in 1979 and in 2015 the college celebrated the matriculation of its 3000th female student with events and exhibitions, including the display of portraits of notable women who had taught, studied or worked at the Hall in the Dining Hall, a noticeable change from the styles of portraits in most colleges. St Edmund Hall is located in central Oxford, on the north side of the High Street, off Queen's Lane. It borders New College to the North and the Carrodus Quad of The Queen’s College to the south. The front quadrangle houses the porters' lodge, the Old Dining Hall, built in the 1650s, the college bar (the buttery), the chapel, the Old Library, offices and accommodation for students and Fellows. An engraving of the college coat of arms is found above the entrance to the college on Queen’s Lane. As seen in this image, the coat of arms sits above the following Latin dedication "sanctus edmundus huius aulae lux", or "St Edmund, light of this Hall". It is a very common practice within the University to use chronograms for dedications. When transcribed into Latin, they are written in such a way that an important date, usually that of a foundation or the dedication itself, is embedded in the text in Roman numerals. which is a popular, if conservative, estimate for the establishment of the Hall. It is also the date of the canonisation of St Edmund of Abingdon. In the centre of the quadrangle is a medieval well, which was uncovered in 1926 during the construction of a new lecture room and accommodation. This well is believed to be the original from which St Edmund himself drew water. A new wellhead was added, with the inscription "haurietis aquas in gaudio de fontibus salvatoris," Latin for "with joy, draw water from the wells of salvation." These words, from Isaiah 12:3, are believed to be those spoken by St Edmund on his deathbed at Salisbury. A metal grate was added to the well to prevent injuries, but water can still be seen in the well at a depth of about 9 feet. Plans to add a wooden frame and bucket were scrapped to maintain the overall appearance of the quad. The east side of the Front Quad contains the chapel. The chapel contains a stained glass window which is one of the earliest works by the artists Sir Edward Burne-Jones and William Morris, and a painting above the altar named Supper at Emmaus, by Ceri Richards. Often described as a 'marmite painting' due to its anachronous style within the chapel, which dates to the late 17th century, the painting commemorates the granting of the college's Royal Charter. The organ was built by Wood of Huddersfield in the 1980s. The St Edmund Hall Chapel Choir consists of eight choral scholars, two organ scholars and many other non-auditioning singers. The choir goes on two annual tours, including trips to Wells Cathedral in 2017, Pontigny, France, the burial place of St Edmund, in 2016 and Warsaw, Poland in 2015. Above the chapel is the Old Library. It was the last among Oxford colleges to chain its valuable books, but the first to have shelves against the walls. The Old Library is no longer the main library of the Hall, but is used for events and for research. The college library, the deconsecrated 12th century church of St Peter-in-the-East, was converted in the 1970s, and includes the 14th century tower, which houses a tutor’s room at the top. The oldest part of the library still standing is the crypt below the church, which dates from the 1130s. The library is situated in the original churchyard of St Peter-in-the-East. 40,000 volumes are housed within it to cater to the wide variety of courses offered at the Hall. While many of the graves have been disinterred, several gravestones remain including one belonging to James Sadler, the first English aeronaut, and another which states the occupant died upon February 31st. The garden contains a seated bronze sculpture of St Edmund as an impoverished student, made by Teddy Hall alumnus Rodney Munday. At the rear of the main site is a more modern area, which houses the dining hall, teaching facilities and undergraduate accommodation in the Kelly, Emden, Besse and Whitehall buildings. All first-year undergraduate students are guaranteed accommodation on the main site and many return for their third year after living out, usually in East Oxford, for the duration of their second year. The Wolfson Hall, the twentieth-century dining hall, seats approximately 230 people and is used by students on a daily basis for breakfast, lunch and dinner. 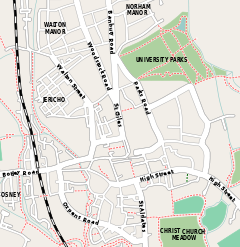 The college also owns annexes at Norham Gardens, on Dawson Street and on Iffley Road. The Norham Gardens annexe includes the Graduate Centre, a complex consisting of several large Victorian villas. This site was for many years the home of St Stephen's House, Oxford, before that institution moved to Iffley Road in 1980. The Norham Gardens annexe has the capacity to house most first year graduate students and has its own common room, IT facilities, gardens and gym. In addition to student rooms, the Graduate Centre also has a quantity of faculty housing. The Dawson Street and Iffley Road annexes host undergraduates who do not live on the main site in pleasant en-suite, self-catering rooms. As of 2017, the college has roughly 410 undergraduate, 300 graduate students and 75 Fellows, organised into three common rooms. The Junior Common Room (JCR), for undergraduates, and Middle Common Room (MCR), for postgraduates, both organise regular events, including a Freshers' week programme, dinners and film nights. The college is reputed for the strength of its 'Hall Spirit' with the semi-finals and finals of sports competitions regularly attended by in excess of 70 supporters, remarkable for a college team. Over 250 were in attendance as the team won Football Cuppers in 2017. The atmosphere of the college is relaxed and welcoming, known for accommodating students of all and any kind. Creative writing is a particular strength of St Edmund Hall. The college has a weekly creative writing workshop, a termly poetry reading series, an online writers' forum and The St Edmund Hall Gallery, the annual student arts and literary magazine. The college runs an annual journalism competition for Oxford University students, in memory of alumnus and promising young journalist Philip Geddes, who died in the IRA bombing of Harrods in 1983. The college also hosts an annual lecture in his name. St Edmund Hall has a lively drama society, the John Oldham Society, which worked in Cameroon in 2013 on a community drama project. St Edmund Hall is known for its sporting excellence and participates in a large number of sports including rugby, football, rowing, tennis, cricket, mixed lacrosse, netball, hockey and basketball, among others. Since becoming a college in 1957, the Men’s rugby team has won over half the Cuppers Tournaments it has ever entered. In 2016–2017, St Edmund Hall won men’s football and cricket Cuppers and its women’s first boat and men’s second boat won blades in Bumps. As a part of a team consisting of several colleges, Teddy Hall won women’s rugby Cuppers in 2015–2016. Strong performances are also consistently recorded in men's and women's hockey, badminton and canoe polo. The St Edmund Hall Boat Club also has a history of sporting success. The Boat Club has held men’s headship in Summer Eights five times between 1959 and 1965 and women’s headship from 2006 to 2009. The college celebrates the students’ successes in sports, arts and other extra-curricular activities at the annual Achievements Dinner. Cuppers winning teams are also rewarded with their photograph in the college bar, the walls of which are now crammed with teams dating from the late nineteenth century to the present day. The college also awards the Luddington Prize to undergraduate students who manage to achieve both a First Class degree in finals and a university Blue. The College has a very active outreach and access programme, orchestrated by the dedicated Schools Liaison Officer and supported by a team of over 30 volunteer Student Ambassadors. Working with schools in the assigned link areas, including Leicestershire, Hampshire, the Isle of Wight and Peterborough, the College hosts visits from school groups and was one of the first colleges to take student ambassadors on an access roadshow. This saw four students and the Schools Liaison Officer visit nine schools in 4 days in Hampshire and the Isle of Wight in 2016 and continues to take place annually. The College since has expanded its provision to include a second roadshow in collaboration with Pembroke College, Cambridge, visiting schools and colleges in Leicestershire, which first took place in November 2018. To which the assembly responds Amen. More extended (or sung) forms of the grace are sometimes given but this is limited to special occasions, such the Feast of St Edmund, a formal held each year to commemorate the namesake of the hall. The traditional college toast is occasionally also said at dinners, and is simply "Floreat Aula", Latin for "May the Hall Flourish". Jeremy Paxman, a Fellow of the College by Special Election. ^ "St Edmund Hall". University of Oxford. University of Oxford. Retrieved 14 September 2016. ^ Cowdrey (1988); p. 388, referencing A.B. Emden who in his 1927 (p. 236) work states: "...and St Edmund Hall now survives as the last lineal descendent of the oldest form of academical society designed for the residence of scholars studying in the Oxford Schools." ^ a b c d "About the College: Full History of the Hall". St Edmund Hall. Retrieved 4 May 2018. ^ "St Edmund Hall : Annual Report and Financial Statements : Year ended 31 July 2018" (PDF). ox.ac.uk. p. 19. Retrieved 5 March 2019. ^ "Celebrating 3000 Women at St Edmund Hall". St Edmund Hall. ^ "Visitor, Principal and Fellows". ox.ac.uk. Salter, H.E. and Lobel, M.D. (eds)  (1994) "St. Edmund Hall", In: Victoria County History: A History of the County of Oxford: Volume 3: The University of Oxford, The Victoria History of the counties of England, Folkestone : Dawson for the University of London Institute of Historical Research, ISBN 0-7129-1064-6, p. 319-335. 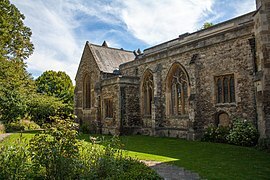 Wikimedia Commons has media related to St Edmund Hall.